Brief Summary: John Mauro, Phil Higuera, and I skied the Emmons-Winthrop Glaciers from the true summit down to Camp Schurman, and then down past the toe of the Inter Glacier. Surprisingly, the Emmons-Winthrop route was still continuously skiable from the summit to below 9000 ft, with very manageable crevasse crossings and no need to rope up on any portion of the ski descent. The bergschrund crossing was very safe and easy, but there was one potentially hazardous slightly uphill traverse during the descent, just above a huge gaping crevasse at 13300 ft, where some parties might choose to de-ski and hike across on foot with crampons. Recent reports of blue ice above 14000 ft appear to have been overstated, my skis never touched anything resembling blue ice (the snow surface above 13600 ft was a patchwork of smooth firm wind-packed powder and areas of small 1-2 inch sastrugi, but all very white). Suncups were minimal above 12000 ft, the snow surface was quite smooth and only lightly dimpled. There were huge dirty suncups in places below 12000 ft, but also large areas of very smooth snow. As a whole, the route was in fine skiing shape for late July. However, the current spell of warm weather is likely to finish it off as a viable ski route very soon. The Inter Glacier remained skiable from 9500 ft down to 6500 ft on very well-consolidated snow with moderate suncups, but was melting out rapidly to bare rock and glacial ice near the bottom. Overall, we climbed and skinned about 10500 vertical ft of total ascent for over 8000 vertical ft of skiing from the 14410 ft summit all the way down to 6500 ft (including a 150 ft reascent on foot from the Emmons to the Inter Glacier). We had perfect weather conditions, sunny with 14000+ ft freezing level and moderate 10-20 mph winds at the summit. A spectacular trip, wow! Longer Report: Well, it had been 5 years since the last time I'd skied from Rainier's summit, and I was desperate to ski it again. I'd been trying to organize a trip to ski either the Fuhrer Finger or Emmons-Winthrop routes all spring, but appropriate weather and available partners had never come together at the same time and so the trip never even got off the ground. Same old thing as had happened to me in 2002 and 2003, very frustrating. I knew that it was getting late in the season, but I figured the Emmons would still provide a good ski descent this weekend if I could just find partners. A perfect forecast for a lengthy period of stable high pressure with 14000 ft freezing levels added to my sense of urgency, since the route would rapidly deteriorate after a week of such hot weather. It was certainly either now or wait till next year. 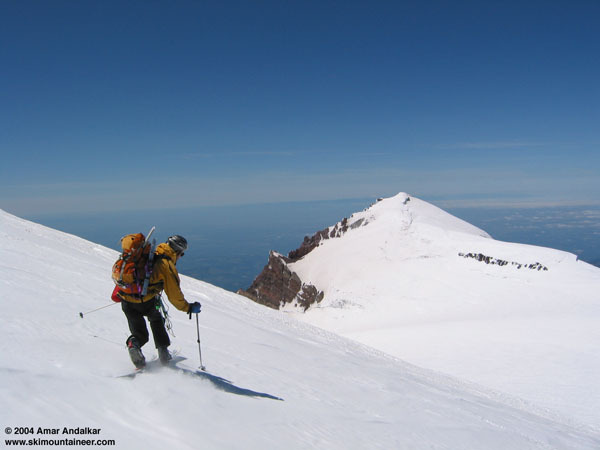 Luckily, I noticed a random post on TAY by ski_photomatt in the July 16 Nisqually Chutes thread, asking about Rainier conditions for some friends of his who wanted to ski the Emmons. I emailed Matt on Wednesday and eventually by Friday afternoon, I was in contact with Matt's friend John and we working out the details of the trip. Rainier was finally going to happen. John, Phil, and I set out from Seattle at dawn on Saturday, planning to be at the White River ranger station by the time they opened at 7am in order to have any hope of getting the required permits. There was already a small line waiting outside, and when the door opened the first ranger said that all permits for Camp Schurman, Camp Curtis, and Emmons Flats were already gone. Ugh. But luckily, he was wrong and the other ranger said that 8 spots were still open at Schurman due to a cancelled reservation. We sighed in relief, paid our fees, and drove to the White River campground trailhead at 4300 ft. We headed up the trail just after 8:30am, keeping a leisurely pace all the way past Glacier Basin to the edge of the first snow patches at 6500 ft, about 3.5 miles in. Continuous snow lay just beyond and so the skis finally came off our packs. We skinned up the steep toe of the Inter Glacier, avoiding the mostly bare glacial ice by hugging the moraine along the right edge, and then continued across the flatter terrain above. A few open crevasses and patches of bare ice were visible, but mostly the Inter Glacier was in good shape for skiing. Unfortunately, we skinned a little too high up the Inter Glacier, missing the 9000 ft crossover onto the Emmons Glacier by about 300 ft (our altimeters were also reading 200 ft too low by that time). Instead of losing the extra elevation by backtracking far down the bare ridge, I tried a semi-direct descent to the Emmons along a faint way trail and ended up sliding about 15 ft down crumbling loose rock just before I reached the glacier's edge. Luckily I escaped with only numerous bloody scrapes but no serious injuries, and John and Phil wisely climbed around the longer way and took the more standard climber's trail without incident (still steep and loose, though). Numerous cracks were open all along the edge of the Emmons, and other parties climbing on foot were breaking out the ropes for the short jaunt to Camp Schurman at 9500 ft. After much discussion, we decided to do the same and so we skinned the rest of the way to camp roped up, arriving by 5pm. Camp Schurman was mostly melted out, only about half the parties were camping on snow. A steady meltwater drip along the edge of a moat beside camp provided a good source of treatable water without the need to melt snow. It was a pleasant and warm evening at camp, marred only by a breezy downslope wind from the Emmons, and by 9pm we were in our bivy sacks planning for a 3:30am alarm. We knew that we could sleep in late relative to climbing parties, since we needed the snow to soften and didn't want to be skiing down until noon or maybe even 1pm. Unfortunately, a number of aggressive mice annoyed and harassed us throughout the night, trying to chew into any food-containing bags and even running across our faces. Numerous climbing parties set off noisily throughout the night, some leaving as early as 11:30pm, adding to the repeated disturbances. We awoke at 3:30am to a nearly quiet camp and were treated to the spectacle of the northern lights visible past Steamboat Prow to our north. To the south, headlamps from several climbing parties were visible far above on the Emmons Glacier. The snow had frozen firmly during the clear night despite temperatures in the 40s F. Thus we headed up on foot with crampons just after 5am, roped up and with skis on our packs. A well-established boot pack provided very easy routefinding up the Emmons, and we made good time despite several breaks to enjoy the glorious sunrise and eat and drink. We noted the numerous zigzags of the route with care, trying to remember which side of the boot pack we would have to be on during various parts of the ski descent. By 10am, the first climbers were descending past us as we angled right towards the Winthrop Glacier. At 13300 ft, the route traversed nearly a half-mile west, gaining and losing small amounts of elevation before climbing to the summit plateau at 13600 ft just south of Curtis Ridge. The bergschrund and crevasse crossings had all been quite easy, but we knew this up-and-down traverse would be difficult on skis during the descent. We unroped on the plateau, and a quick hour of climbing directly up the northwest flank of the summit dome put us atop Columbia Crest just after 12:30pm. Surprisingly, we had Rainier's summit all to ourselves on a perfect day during the prime of the climbing season. Eventually, a couple of other climbing parties arrived via the Emmons and the DC, the last stragglers of the day. Temperatures were above freezing and the snow on the crater rim had softened a bit, so the ski conditions looked to be as good as we could hope for. We lingered at the summit and finally skied down after 1:30pm, negotiating the small sastrugi and enjoying the firm wind-packed powder of the summit dome down to the plateau. We skied in our harnesses, but the rope stayed in the pack for the entire ski descent. Unfortunately, the snow on the steeper northern aspects had not softened as much as we had hoped, thing were still quite firm above 13000 ft. We negotiated the tricky up-and-down traverse at 13300 ft, sidestepping gingerly for the short upward section across a steep sidehill above a huge open crevasse. The snow surface beyond that was predictable if not enjoyable, a bit too firm to really open it up, but generally smooth and not badly suncupped. Eventually as we neared 12000 ft, the snow began to noticeably soften, first into a slightly breakable crust and then quickly into mush. The soft snow made navigating a few areas of huge dirty suncups tolerable, although some spots required sideslipping to get through, and then numerous sections of smoother snow along the Corridor provided the best turns of the day. The last 500 ft though Emmons Flats and into Camp Schurman were superb, arcing fat GS turns in full view of the audiences below. By 3:30pm we were back in camp, resting and rehydrating and packing for well over an hour. Others in camp told us of a climber who had fallen into a crevasse on the Inter Glacier, so we made the decision to keep our harnesses on for the remaining 3000 ft of ski descent with heavy packs. The ski descent down the edge of the Emmons to 9000 ft was nice despite the added weight, the snow was generally smooth with wide shallow suncups. The 150 ft climb up on bare crumbly rock and dirt to reach the Inter Glacier was unpleasant, but luckily it was over quickly and the skiing could resume. The rest of the trip down the Inter Glacier passed uneventfully, we stayed well to the left of the boot pack and glissade tracks which passed through an area with numerous incipient crevasses (probably where the earlier accident happened). We followed a much smoother and nearly crevasse-free line, moderately suncupped with soft corn snow. We sprayed the mushy snow down past the toe of the Inter Glacier and skied out all the way to 6500 ft by 6pm. A quick but nevertheless painful hike down the trail brought us back to the car in under 90 minutes. We were thrilled to finally shed our burdensome loads and bask in the evening glow after a spectacular and memorable ski descent of Rainier. John Mauro carves the wind-packed powder on the northwest side of the summit dome, with Liberty Cap rising behind and the Olympics visible on the horizon beyond the Puget Sound basin. Click here for an enlarged version of this photo. Amar: Congrats on a full summit descent! I'm not clear as to how often this occurs, but I don't hear of many per year. And, to be able to do it in late July is quite a feat, especially finding the conditions you did. Congrats - now you can stop whining about having not skied it in 5 years . Good thing you had a safe trip...doesn't sound like all did on the Inter this past weekend based on the crevasse rescue that occurred there (see cascadeclimbers for details). Sounds like there wasn't even a noticeable sag - yikes! I did this last year and it was the worst descent I've ever done. The sastrugi was 1 to 2+ feet deep, the wind was blowing me off my feet and throwing rocks in my face, so I crawled to the summit. I was happy to summit and even managed to enjoy the challenge of the descent in a whiteout. Ha. I remember reading a report of you skiing it in near perfect conditions a week or so before I went on that trip, so maybe the key is to not follow in Amar's footsteps. Wait a minute, I'm not to blame for that. I haven't skied the Emmons since July 1999, so it must be somebody else that said it was great last year. You gotta know how to pick the weather too, I'm a big fan of stable high pressure systems with 14000 ft freezing levels. Anyway, I certainly wouldn't encourage anyone to follow our footsteps onto the Emmons this year (at least not for skiing), the route is rapidly deteriorating in the hot weather and crevasses are opening up all over the Corridor. As usual, go at your own risk and know that conditions are constantly changing. Regarding the crevasse fall on the Inter Glacier, when we skied down to Camp Schurman, others told us that ranger Dave had gone down to rescue a climber who had fallen in on the Inter Glacier. That led to our decision to keep our harnesses on during that portion of the ski descent, even though I've never worn a harness the previous 6 or 7 times I've skied that glacier over the years. Other climbers were still descending the Inter Glacier unroped and not even wearing harnesses, which leads me to wonder whether the altitude had killed off their brain cells (surely they had heard about the crevasse fall at camp, just like we did). I think I would never again climb or descend the Inter Glacier unroped on foot after hearing so many stories about crevasse falls on it (I had climbed it once unroped on foot in July 1996 and skied down, before I owned AT gear). I will continue to ascend and descend the Inter Glacier unroped on skis, but I will probably avoid late season solo trips there (I'd been thinking about skiing it midweek last week before the Emmons trip). That's interesting, and made me think about something I've always wanted to ask - is one any safer crossing crevassed terrain on skis as opposed to foot, or is that more superstition than fact? Started a thread http://www.turns-all-year.com/cgi-bin/yabb/YaBB.pl?board=ha1;action=display;num=1090877126 here to avoid derailing the TR, if you have any thoughts about that. Me and weather don't like eachother. We went out for awhile then it just up and dumped me for 'midweek'. As a result we're not on speaking terms now, but I'm hoping by winter we'll get back together because she was hot. Seriously though, I thought that was a TR from you (not that I care either way. I just thought I'd mention and give you props for having a good weekend). I try to get up there myself and ski most of the emmons if not all at least once a year, usually in the hope of some late season turns. yeah, but it looks like you had type weather on your decent of Sherman Peak a couple of weeks ago, so it must like you some of the time. Sounds like nice skiing, way to get after it Amar, John and Phil. Congrats on the summit. It's great to hear everything worked out.